Those bonds were previously held by the Hellenic Financial Stability Facility (HFSF). They will continue to be available for the 4-month extension period and can only be used for bank recapitalisation and resolution costs upon request by the ECB’s Single Supervisory Mechanism (SSM), according to the Eurogroup statement. HFSF share capital stands at 49.7 billion euros, of which 1.5 billion was initially injected in the form of cash and the remaining 48.2 billion in EFSF bonds. The initial agreement provided for the return of the EFSF bonds upon the completion of Greece’s eurozone bailout programme. In the fourth quarter of 2014 the previous government was reportedly planning to retain 2-3 billion for potential future capital needs and return the remaining amount to the EFSF. Earlier this week the Greek government made an official request to Eurogroup President Jeroen Dijsselbloem for a return of 1.2 billion (of the 10.9 billion) since a part of Greek bank recapitalisation and resolution costs was covered by cash. The total cost of bank recapitalisation and resolution reached 40 billion euros. Of this, 25 billion was for the recapitalisation of the four core banks in the form of EFSF bonds in the Q2 of 2013 and 15 billion to cover the funding gap and recapitalisation of non-core banks. Thus, subtracting the 40 billion euros from the 49.7 billion HFSF share capital, we get 9.7 billion that should be left aside and theoretically returned to the EFSF. 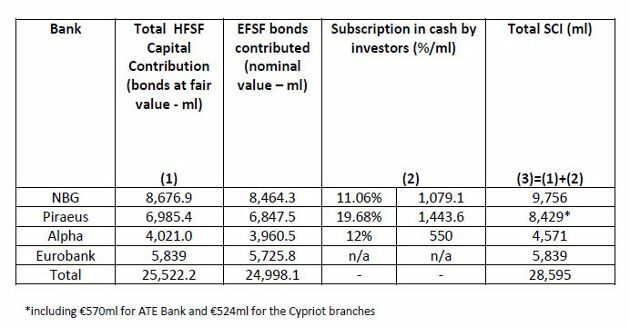 However, the amount of EFSF bonds held by the HFSF was higher (10.9 billion) as part of the money paid for the non-core banks was in the form of cash. a) The one-off presubscription fee of 555.6 million which essentially related to a 10 percent annual dividend on Greek banks’ state preference shares (pillar I bonds), which for legal purposes was received by the HFSF as a fee. b) 310 million (90 percent of the remaining cash of 345 million) to cover short-term funding needs primarily through purchases of T-Bills. Summing up, the maths shows that from the 49.7 billion euros injected into the HFSF, 40 billion was actually used for bank recapitalisation and resolution. This means the unused paid in capital stands at 9.7 billion, 1.2 billion lower than the 10.9 billion returned to the EFSF. The HFSF table shows that from the 48.2 billion of EFSF bonds received, 37.27 billion were actually used and 10.93 billion were untapped. In addition, total bank recapitalisation and resolution costs of 40 billion were paid by the 37.27 billion of EFSF bonds, 1.5 billion from the initial cash and 1.19 billion from the fund’s cash proceeds. The latter is the amount that Greece is currently requesting to be returned. According to the fund’s CEO Anastasia Sakellariou “the allocation of the HFSF’s resources was appropriate based on prudent treasury management practices, given the coupon payments received from the EFSF bonds versus the low or zero interest income from deposits at BoG”. This explains the use of cash proceeds instead of EFSF bonds for some HFSF activities. However, since the initial agreement provided for the return of the untapped EFSF bonds (10.9 billion) and not for the unused paid in capital (9.7 billion), the legal process for claiming the difference of 1.19 billion is rather complicated. Sakellariou said, though, this is a legitimate request. 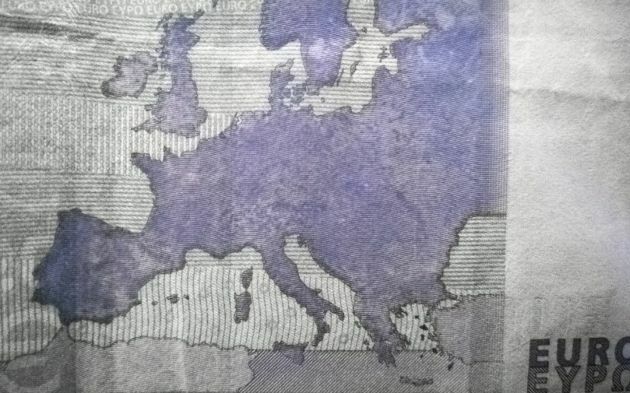 The Euro Working Group (EWG) reportedly said that Greece is not legally entitled to this money, while a German Finance Ministry spokesman made a similar statement. EWG experts reportedly agreed the issue would be studied in greater detail, which probably suggests there will have to be a decision at a political level on what to do with the money in question. Even if the 1.2 billion euros is returned, the key issue is whether they would be in the form of EFSF bonds or cash. We understand that the government could utilise this amount only if it is in cash, as it recently did with the 345 million HFSF cash reserves. Sakellariou was so incompetent to allow transfer of the 1.2 Bil. disputed amount? What was she doing? Asleep on the switch? Where does Greece find these incompetent clowns and installs them in key positions? This is how we are going to negotiate with Berlin? By putting clerks and common secretaries in positions requiring education and sophistication barred none?